This is the seventh in a series of articles that will cover a number of variations on classical yoga practices in the hope of supporting teachers in finding safe and beneficial ways for all students to participate. In many ways, the practice of yoga is about changing our perspective, shifting our relationship with the body as well as the mind. As we change our perspective, we may begin to see the body in a new light—as the essential vehicle for our temporary human journey. Instead of idolizing or demonizing it, we then might treat the body with love, caring for it with proper exercise, nutrition, and rest. Practices like inversions help us to make this shift by literally turning the body on its head. Inverted poses are defined as those that bring the heart above the head. With this new relationship between heart and head, we can learn to quiet the mind and allow space for the wisdom of the heart to guide us. The heart first feeds itself, bringing oxygenated blood to the coronary arteries, and then focuses on bringing blood to the brain. To do this, blood pressure constantly adapts to our relationship to gravity to regulate the flow of blood to the brain. This is why we need to make sure students make slow transitions from lying to seated to standing when practicing. If we stand up too quickly, it may take a moment for blood pressure to compensate and we may experience light-headedness or dizziness. This is especially true for seniors and those with compromised cardiovascular systems. For many people, poses like headstand and shoulderstand are not accessible. So here are some variations that offer many of the same benefits. Inversions, like so many yoga practices, support us in weathering the eternal forces of gravity and time. Many of the challenges associated with aging are specifically related to gravity: postural issues, prolapsed organs, varicose veins, hemorrhoids, and more. Changing our relationship to gravity by inverting the body can help us to renew the body and undo some of these problems. The issue is that inversions are often physically challenging postures that put pressure on the head and neck. For many people, poses like headstand and shoulderstand are not accessible. So here are some variations that offer many of the same benefits. 1. Legs up the Wall. This pose has become synonymous with restorative yoga and is a welcome variation to shoulderstand. Strictly speaking, raising the legs up the wall with the torso flat on the floor is not a true inversion—the relationship between head and heart has not changed. Consider placing a bolster under the students’ pelvis to create a slight incline in the torso and more of an inversion. Also, a blanket under the head can reduce the feeling of pressure in the head. 2. Wall Bridge. From legs up the wall, have students bend their knees just enough to place their feet flat on the wall, hip-width apart. Arms are alongside the body, with palms down for support. Tell them to press into their feet and lift their hips up into wall bridge with the knees at a right angle. Hands can come up to support the low back if needed. Make sure there isn’t too much stretch on the back of the neck and that the weight is on the shoulders. There should always be space under the back of the neck. If not, the student can use a blanket under the shoulders, or practice legs up the wall. Another gentle variation of sarvangasana is to have students lie on the floor with their calves and feet resting on the seat of a sturdy chair. 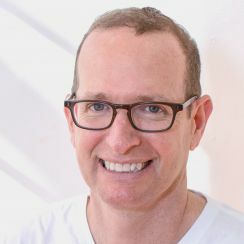 As in legs up the wall, a blanket can be placed under the head to lift the head slightly, so the forehead is level with or slightly higher than the chin. Also, a bolster under the pelvis can create a gentle incline for the torso. This can be practiced in bed with the legs elevated on a pile of pillows or blankets. In a hospital bed, the legs can be elevated by raising the bottom portion of the bed. 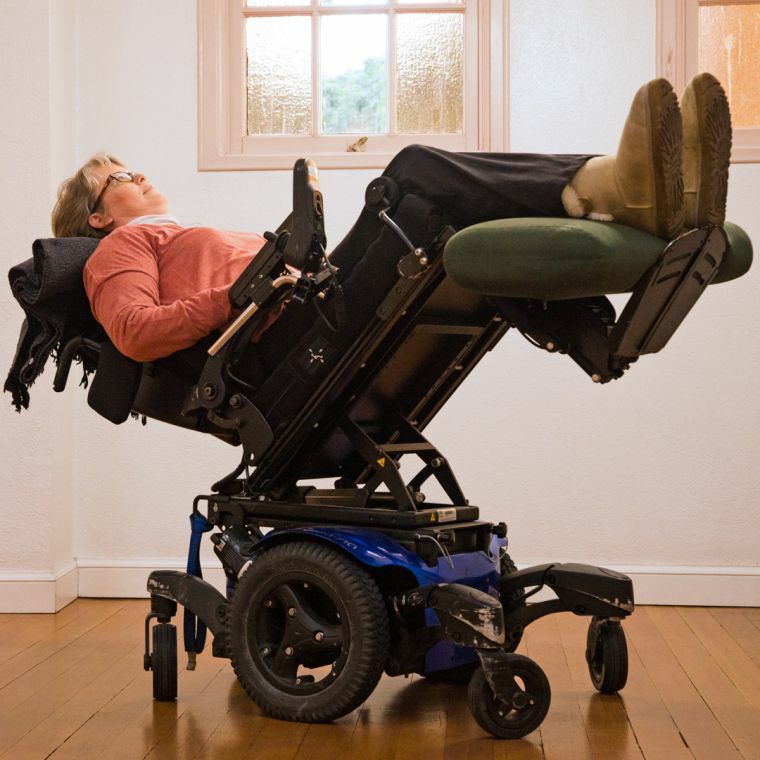 Some power wheelchairs are able to make this happen as well, which is helpful for students who are practicing in their chair. Bridge pose is a gentle inversion that offers many of the benefits of shoulderstand without the challenge of supporting the weight of the body on the shoulders. To make the bridge more accessible, students can practice with a support under their sacrum, either a block or a large bolster, which is softer and offers a larger surface area. When using a block, the height can be adjusted according to the students’ size and flexibility. Begin with the block placed on its flat side perpendicular to the spine and then give students the option to move the block to its next highest setting if they would prefer. From a supported bridge, students can bend their knees toward their chest and then raise their legs up toward the ceiling. This creates the opportunity to come into a version of viparita karani mudra, upside-down seal pose, which is similar to shoulderstand, but in which the hands support the raised pelvis and there’s a deep bend in the hips. In this version (pictured below) the prop is supporting the pelvis instead of the hands. 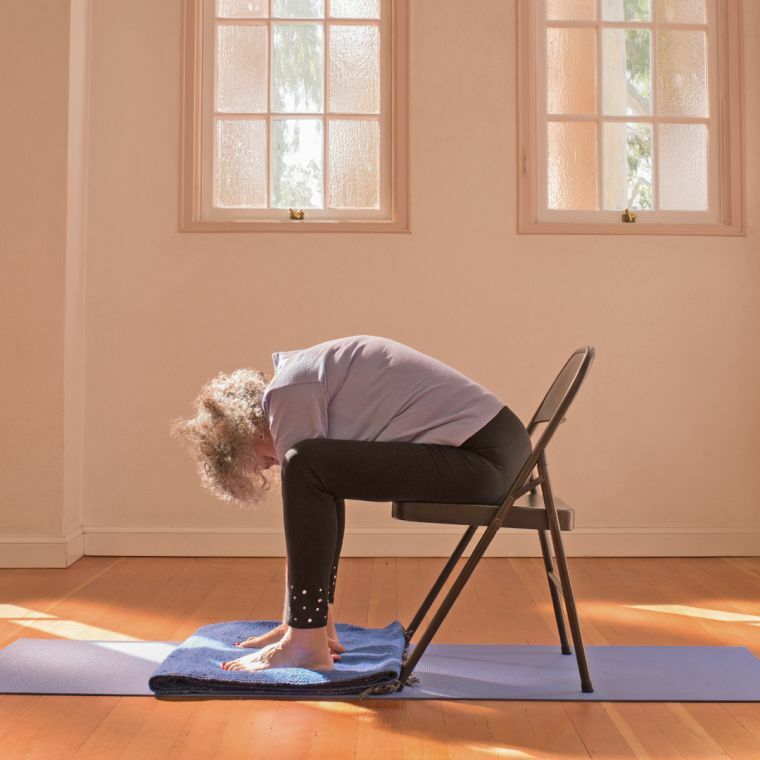 For students practicing yoga in a chair, it can be challenging to find a safe inversion. A seated forward bend, carefully hinging at the hips and relaxing their head and neck, is one possibility. Another option is supported chair child’s pose. This isn’t technically an inversion, but it can create the inward experience of inversions, especially if there is gentle pressure on the forehead. Place a second chair in front of the seated student with a bolster and folded blanket on it perpendicular to the student. 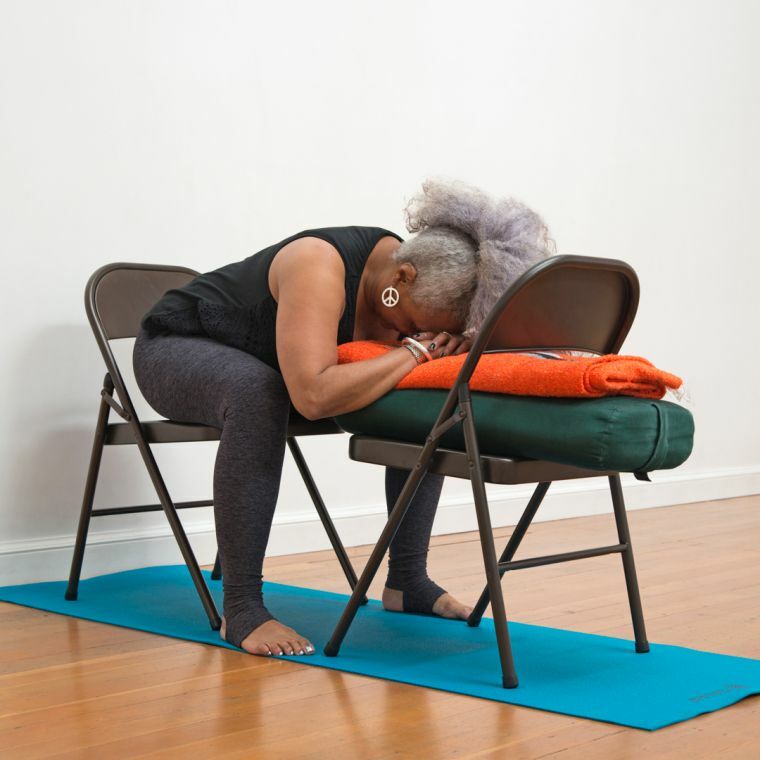 Have the student hinge forward at the hips and place their chest on the bolster, allowing their arms to rest alongside the bolster on the seat of the chair. They can also stack their palms on top of the bolster and rest their forehead on their hands (as pictured below). Adjust the blanket to elevate the chest or head so that breathing is easy and relaxed. Many yoga students perceive inversions as the ultimate practice of yoga, but these poses can be challenging and even dangerous. As yoga teachers, we need to explore variations such as these to make inversions accessible to all our students, so they can get the benefits of these powerful practices without risk of injury.